The maiden Okwahuman Beaty Pageant shall be sponsored by Liberty Industries, producers of the kpokeke atadwe ginger liquor, says Nana Fosu, the Chief Executive Officer for Amusement Multimedia, organizers’ of the event. Speaking at the official launching of the beauty pageant at the MJ Grand Hotel in Accra recently, Nana Fosu expressed his delight at Liberty Industries for coming on board to help make the maiden beauty pageant a success. He said’’ the producers of the atadwe ginger liquor came on board to be the headline sponsors of the event to help promote the rich culture of the Kwahu’s and to also help brand their products. Liberty Industries has given the assurance that they will do everything possible to ensure the pageant becomes a reality and memorable. He pointed out that the pageant is a program designed to showcase the beauty and rich culture of Kwahu not only to Ghana but to the world at large. 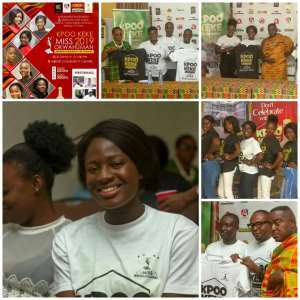 Another objective of the pageant dubbed the ‘’ Maiden Kpokeke Beauty Pageant’’ is to focus on how to improve education in the Kwahu enclave as well as promote vocational skills for the youth to be industrious in any field they may find themselves. According to the Amusement Multimedia Boss, Kwahu’s are known for their strong entrepreneurial acumen, skills, and intelligence and that motivated his outfit in partnership with the Kwahu Traditional Council to unveil the 2019 edition of the Kpokeke Beauty Pageant. The 2019 Kpokeke Miss Okwahuman Beauty Pageant also has the MJ Grand Hotel at East-Legon, Accra and the Kwahu Traditional Council as partners. Nana Bamuhene of Mpraesu who chaired the occasion, on his part assured the contestants and the gathering of the strong backing of the Kwahu Traditional Council to see to it that the program slated for Kwahu during the Easter festivities becomes a successful one.